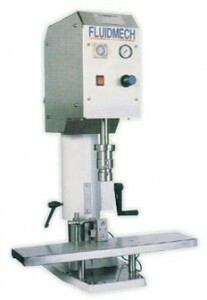 A semi-automatic single head type capping machine specially designed to treat plastic screw-on caps onto various type and size of bottle. Capping chuck heads are made to suit type of cap profile. Capping head with adjustable torque adjustment device. Capping head with adjustable height to handle different height of containers. 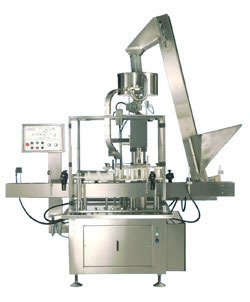 Up/Down stroke of the capping head is operated by pneumatic cylinder. The Pick & Place capping system has been designed to offer the industry a versatile, low maintenance and user-friendly solution to a wide variety of capping requirements. It is ideally suited to environments that require frequent product changeover and a high degree of flexibility. Adjustments are carried out by means of quick release levers, hand wheels and pneumatic gauges. An adjustable cap chute caters for most cap designs and types. 2 liters container can easily be handled at high speed. Virtually eliminates cross threading or cap misplacement. Ensure accurate orientation of caps in relation to containers. uses simple ladder logic familiar to most service electricians. 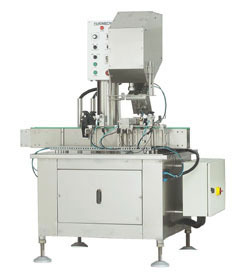 An automatic single head-capping machine specially designed to treat plastic screw-on caps onto all types of bottle. Capping heads are specially studied for screw-on caps. Mechanical cap sorter positioned and oriented the caps, then send the caps to the neck of the bottles through a special chute. Advance technical design of the capping drive head allows the application of screw-on caps of various sizes and types to be applied. Capping chuck heads are made to suit each cap type profile. Regulation of cap application torque by adjusting the infeed air pressure enable the capping even of soft PVC bottles.